With a remarkable capacity of 7.0 cu. ft, among the most practical features of the Frigidaire FAQE7077KR electric dryer are its DrySense Technology and NSF Certification. The DrySense Technology makes use of moisture sensors to deliver only precise and complete drying for your laundry, while keeping it wrinkle-free. Its NSF certification and Sanitize Temperature settings make sure that your clothes come out of the dryer free from bacteria and other contaminants. This dryer comes with multiple cycles and multiple options, including 7 dry cycles, 12 dry options, and 4 dryness level selections. Cycle options range from Ultra Delicates to Heavy Duty while dry options include Extended Tumble and Shrink Guard Ultra. Dryness Level Selections range from Damp Dry to More Dry. DrySense Technology utilizes moisture sensors that help deliver the required drying temperature so that your laundry comes out completely dry, but without the wrinkling and overdrying. There is a Precision Moisture Sensor that monitors the level of moisture within the drum. This NSF certified dryer includes a Sanitize option among its temperature settings, resulting in evenly dried and 99.9% bacteria-free laundry. The SilentDesign Feature helps to ensure that your laundry sessions are as free from noise and vibration as possible. The TimeWise Technology keeps you from waiting for the drying session to finish as wash time essentially equals dry time. You can also save your most favorite settings on this dryer as the Save Your Settings feature makes it possible to do this. Finally, a Quick Cycle allows you to run a fast drying session in just 25 minutes. Express Select Controls allow you to easily opt for the cycles and options you need with just a few button touches. 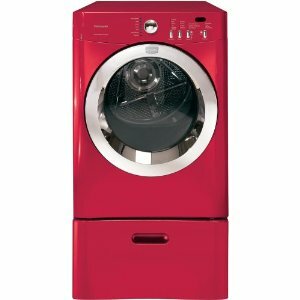 This dryer is available in five different colors, including Classic Red, Classic Blue, Classic Silver, Classic White, and Classic Black. The control panel is easily located at the front side of the dryer for easy visibility and manipulation. Ensure that your laundry gets dried completely without wrinkles through the DrySense Technology and Precision Moisture Sensor. Dry all your laundy in peace anytime you need to, as the SilentDesign feature of this dryer makes sure that each session is as quiet as possible. Use the Quick Cycle setting to dry a few items within a short time, or as quick as 25 minutes. Make sure that all your clothes, sheets, and towels are free from 99.9% of bacteria as this NSF certified dryer also comes with the Sanitize Temperature Setting. Conveniently choose the cycles and options that you prefer for each drying session. This dryer has seven dry cycles and twelve dry options. Some consumers have commented that this Frigidaire dryer is more expensive than most of its traditional counterparts. This dryer lacks a Steam Cycle feature, which is generally considered useful in the elimination of wrinkles and in the prevention of static cling.